Our fulfilment service is a step above the rest, we like to ensure that all clients are satisfied 100% with the service that we provide. We are in constant contact with all clients and keep them up to date on they’re stock and products with our live 24/7 accessible integrated software. We have been storing clients products and shipping them all over the world from our UK and Ireland distribution centres for many years and we believe that what we do creates a simple and easy link between you and your customers. 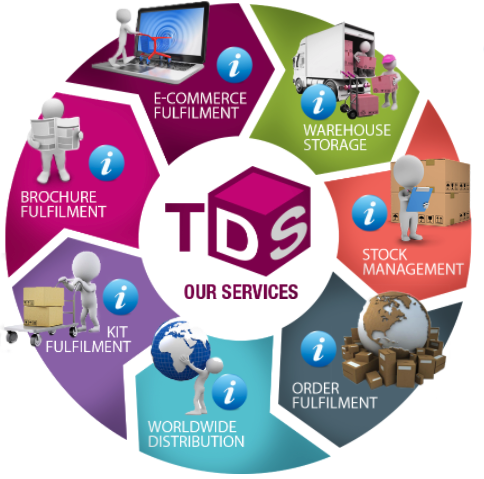 • eCommerce Fulfilment – TDS integrate with eCommerce platforms to make your fulfilment run smoothly on all platforms (Shipstation, Wocommerce, Amazon eBay). • Warehouse Storage – A total of 78,000 sq ft situated in three warehouse locations within the same business park to ensure all products are stored in a cool dry place, and covering all customers’ requirements. • Stock Management – Our warehouses have been designed to store your goods securely with 24/7 surveillance, whether you have one product or thousands. We can create a cost-effective solution to match your fulfilment requirements. • Order Fulfilment – We Pick, Pack, and Post YOUR products in the most professional and cost-effective manner. Professionally labelled for outward and return delivery. • Worldwide Distribution – A portfolio of professionally executed worldwide delivery options tailored to your precise requirements. TDS are confident that we have the expertise to manage all your distribution needs Worldwide. • Kit Fulfilment – Provides an array of pick and pack kitting services to meet your needs. From sales to marketing kits, to gift boxes and promotions. • Brochure Fulfilment – We have a long history in the storage, order assembly and distribution of brochures going back to 1997.